If you’ve ever picked up one of our wooden Kizara memo pads, you probably know they’re very different from the legal pads you’re used to scribbling on. Unlike the usual notebooks, Kizara memo pads contain thin wooden pages shaved directly from blocks of sustainable Japanese pine. Known as kyougi, these traditional wooden sheets were once commonly used to wrap and preserve food in ancient Japan. By that fact alone, it’s become one of our most beloved products. But a Kizara memo pad is more than a cool memo pad; it’s a movement to reclaim the Japanese forest for future generations. Behind its simple design, there’s a long history of craftsmanship and sustainability. During the second part of the twentieth century, the Japanese government undertook a massive tree-planting campaign in an effort to restart the country’s eco-friendly forestry industry. In just a few years, they planted over 24 million acres of trees throughout Japan. Because of their efforts, Japan is today one of the most densely forested territories in the world, and an unheard-of-40% of their forests are man-made. But because it’s expensive to maintain and care for those trees sustainably, most of these forests have since fallen into neglect or downright abandonment. For the eco-friendly local forestry industry, it’s almost impossible to compete with cheap foreign suppliers that operate with unsustainable methods. Despite its vast domestic resources, Japan has become one of the world’s largest importers of lumber. The result is an overcrowded forest population and a struggling local industry that cannot compete without compromising its environmental values. The Kizara Project has a solution: responsible, eco-friendly design that combines ancient craftsmanship with sustainable practices. Kizara supports local Japanese forestry through eco-friendly tree thinning: strategically pruning sick, unhealthy trees and repurposing them into beautiful craft objects. By creating a renewable wood product, Kizara supports not just the growth of a dying industry but also the continued planting and maintaining of those trees. When you purchase a Kizara notepad, you support not only eco-friendly forestry, but also the many hands that continue that work. From design to manufacturing, there’s a story behind every step that goes into making the Kizara notepad. 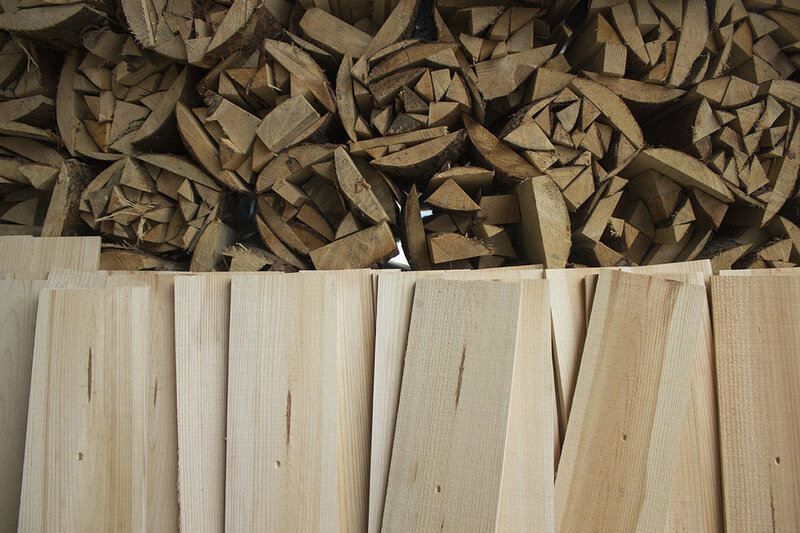 To learn more about it, we talked to owner Satoshi Koike about the people behind Kizara, the intrinsic beauty of wood, and why it’s so important to touch lumber with your fingertips. A craftsman at the Kizara facility in Gunma, Japan. What is the inspiration behind the Kizara project? Keeping the present state of Japan's forestry in mind, we think it's important to make a virtuous cycle of consuming wood sustainably. When I saw the current situation of Japanese forestry, I thought it was important to take advantage of our natural timber. We are always ask ourselves 'What's the value of lumber?' and seek to develop products that showcase the beauty and function of this natural material. What are your favorite aspects of wood? We think there’s a charm in its unfinished coarseness and familiar comfort. No matter what you're using it for, isn't it a material that you find more lovely the moment you touch it? How do you reinvent these traditional wood shaving techniques to create a modern product? Originally, kyougi existed only as a food wrapping. Because only one sheet would needed to wrap food for a one-time use, we thought that there wasn’t much chance for the customer to understand its inner charm. When we thought 'What purpose could we have putting them in a bundle?' and 'How can we make consumers appreciate lumber in a product? ', we ultimately arrived at the idea of converting [kyougi sheets] into memo pads that would maximize the chances of contact with our own fingertips. Can you tell us about the people behind Kizara? Each kyougi sheet is made by 3rd-generation craftsmen. The remaining assembling steps are completed by survivors of the 2011 Great East Japan Earthquake, who now live in temporary housing in the area. What might people not realize about your products? If you look at the memo pad's side profile, you can see that the bundle of sheets pressing together looks like one complete board of wood. We think if you do this you'll understand its true greatness. For a long time now there has not been a lot of demand for wood products in Japan, and the factories that were once there have decreased to smaller family businesses. What do you hope will change through Kizara's efforts? We think that this product is ideal for learning to appreciate the properties of lumber itself. For example, you can easily tear it horizontally, but just like real wood, it won't tear vertically. The wood grain's condition, its brittleness, its aroma--we want as many people as possible to have real contact with lumber and understand its characteristics. Lumber is a material that's often complained about in construction: it warps, bends and gets cracks. We think that if you understand that lumber has those properties from the start, we can begin appreciating the many charms it also provides. That's why we think our kyougi memo pad is good for filling in those gaps in understanding. What would you say to a person looking at a Kizara memo pad for the first time? Please touch the work of Japan's traditional artisan techniques. The kyougi memo pad is a delicate and beautiful product. We think it is a product that represents Japanese culture in profile. This interview has been condensed for length and translated from the original Japanese. Feeling inspired? We're donating a portion of the proceeds from the sale of all 260+ of our wooden products (including Kizara notepads!) to plant trees in our native Philadelphia during the month of April. Shop sustainably and help us keep our city greener, cleaner, and safer for everyone.